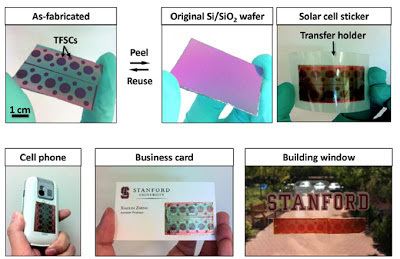 Scientists have developed a solar panel that can be applied to anything from cellphones to business cards. These panels resemble decals that can be peeled and applied on to surfaces like helmets, cellphones, roofs, windows, etc. Solar panels or solar cells convert light energy, particularly light from the Sun, into electrical energy. Solar energy has been the biggest growing trend in renewable energy. In 2011, investments in alternative and renewable energy reached a high of US$ 257 Billion. Since sunlight is unlimited and constant, it is a viable source for endless amounts of energy. Solar panels gather energy by taking advantage of how electrons behave when energy is added to it. At the moment, solar cells are the most affordable and available of the technologies around. Solar panels that generate electricity and provide heating are available commercially. Every year, the solar panel technology increases its efficiency and lowers cost making it more and more viable for use in everyday homes. Recent developments have ranged from solar paint, solar cells that can be painted on to surfaces, to solar cell fibers that can be woven into cloth. Now the ideal is real. Stanford researchers have succeeded in developing the world's first peel-and-stick thin-film solar cells. The breakthrough is described in a paper in the December 20th issue of Scientific Reports. "Now you can put them on helmets, cell phones, convex windows, portable electronic devices, curved roofs, clothing – virtually anything," said Zheng. "Obviously, a lot of new products – from 'smart' clothing to new aerospace systems – might be possible by combining both thin-film electronics and thin-film solar cells," observed Zheng. "And for that matter, we may be just at the beginning of this technology. The peel-and-stick qualities we're researching probably aren't restricted to Ni/SiO2. It's likely many other material interfaces demonstrate similar qualities, and they may have certain advantages for specific applications. We have a lot left to investigate."